Do you know How To Play Old Fashioned Hop Scotch? I’ll bet your parents and grandparents did, but have you played it lately? You could ask them teach you, OR learn from this post and play a game or two. 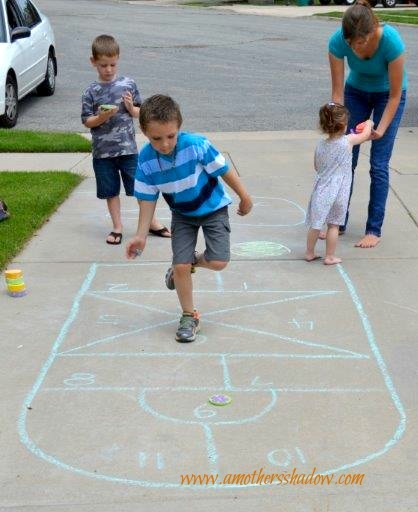 Hop Scotch has been a favortie game for generations all around the world and popular because it’s perfect for all skill levels and ages. WHY is it good for everyone? Because in the game of Hop Scotch you learn and practice skills such as: how to hop, skip, toss, accuracy, and – it is just plain fun! Here’s a bit of trivia before I go so that you can get outside and play Hop Scotch: Did you know this game has been around for hundreds of years? And reportedly even for thousands of years going back to Roman soldiers training for battle! Well, if they could play it so can we!!! 2- Draw your choice of grid with chalk on the driveway OR you can use masking tape on the carpet inside when the weather is inclement. 3- Each player will need a ‘Marker’ which can be a rock, coin, ‘Ta’, anything. 1- First player will toss their marker into the first square (the square with the #1 drawn in it) without landing on the border or bounding out. If the marker does not land in the right square, it is the next players turn. Continue if you are playing alone. 2- Hop through the squares on ONE foot SKIPPING the square your marker is in going up the Hop Scotch grid. Only one foot can be on the ground at one time unless two squares are together then both feet hit the ground at the same time. 3- If you step outside the lines, hop on the wrong square or step on the line you lose your turn. 4- Turn at the end of the grid to face the opposite direction so you can go back down the grid and WITHOUT STEPPING outside the lines, squares or on the lines. 5- Hop back down the grid in reverse order in the same fashion. 6- When you get to the square JUST BEFORE THE ONE with your marker, bend down, standing on ONE FOOT, lean down and pick up the marker. 7- Skip over that square and finish the grid. 8- Repeat this process, tossing the marker to the next square. For example, this time the marker would be thrown into the #2 square. 9- If a mistake is made by tossing the marker into the wrong square, onto a line, outside the grid. Or if when hopping down the grid a player steps on the line, outside the grid, puts a foot down when they shouldn’t, steps in a box they shouldn’t, etc, it is the next player’s turn and so forth. 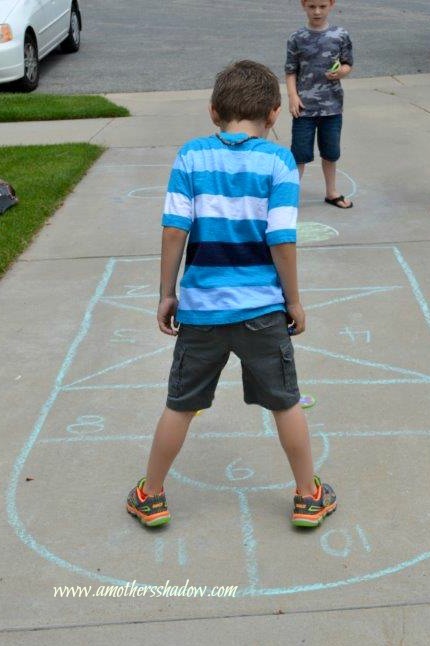 10- The first player to toss their marker into all the squares, completing the hop scotch grid successfully wins! THIS are some great options for hours of entertainment and exercise inside! *The first TWO can be used outside for easy set up and take down anywhere, camping, picnic, family reunion, wherever!